Pat the ribs dry with paper towels and arrange on a large rimmed baking sheet. Season with salt, then rub all over with 3 tablespoons of the dry rub. Cover and refrigerate for up to 4 hours. Bring to room temperature 30 minutes before grilling. Meanwhile, in a medium saucepan, bring the rice vinegar, cider vinegar, Worcestershire, blackberries and 2 teaspoons of the dry rub to a boil over moderate heat, whisking, until the berries begin to break down, about 5 minutes. Remove from the heat. Strain the sauce through a fine-mesh sieve set over a medium bowl, pressing on the solids; discard the solids. Whisk in the brown sugar, tomato paste, blackberry preserves and habanero until smooth. Set up a gas grill for indirect grilling and heat to 250°. Wrap 3 cups of the wood chips in an 18-inch-long piece of heavy-duty foil and poke several holes in the top of the packet. Repeat with the remaining wood chips and more foil, making a total of 3 packets. Pour the apple juice into a small spray bottle. Carefully set 1 wood chip packet directly on the flames; close the grill. When the chips start smoking (about 10 minutes), set the ribs on the grate, bone side down, over indirect heat. Cover and smoke for 1 hour, maintaining 250°. Replace the used wood chip packet. Keeping the ribs bone side down, rotate them on the grill over the indirect heat. Sprinkle with more dry rub and spray with apple juice. Cover and grill for 2 1/2 hours, rotating the ribs, sprinkling with the dry rub and spraying with apple juice every hour, until very tender. Replace the second wood chip packet after 1 hour. 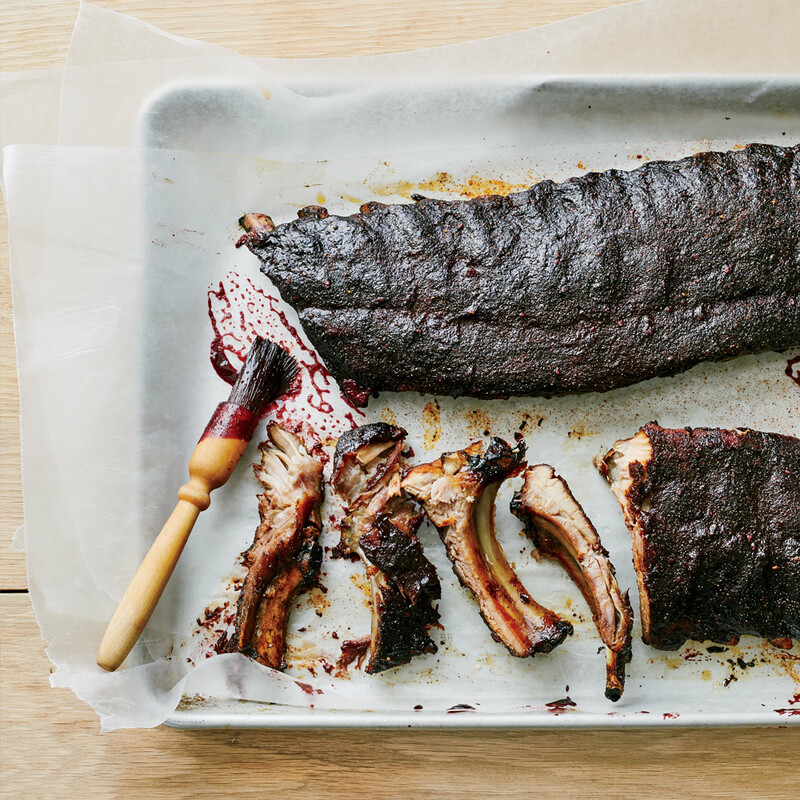 Lightly brush the ribs with the blackberry-habanero sauce, cover and grill for 2 minutes. Transfer to a carving board, brush with sauce and sprinkle with more dry rub. Let rest for 15 minutes. Cut the ribs into sections and serve, passing the remaining sauce at the table. The blackberry-habanero sauce can be refrigerated for up to 2 weeks. Review Body: These I'm going to have to try soon!! !